to "empty" the SharpDX.mediaFoundation dll/xml (extremely ugly hack, to be honest) , and then I implemented playing the MP3 using the native API (declare a MediaElement in the GamePage.xaml, and use it to play an MP3). Thanks for sharing that... I went ahead and did that, unfortunately I had to cut out one of the things in my game because it's dependent on that .DLL, but honestly this is better than nothing. I'm going to go ahead and resubmit. Fingers crossed that it works! Just checking in over here: I did identify the issue and there's actually a fix in SharpDX, but SharpDX hasn't released new binaries since the patch was in place, and therefore, MonoGame isn't using a build of SharpDX with the patch in place. I've reached out to the right folks to see if there's something that can be done for future folks that will run into this. Rather the next SharpDX release. We should be able to upgrade fairly easy now because we're already at 4.0.1 (latest stable) version of SharpDX. Then people that want to release to the MS Store can use a develop build of MG.
You can already use the prerelease SharpDX assemblies from NuGet and release on the MS store with those if you're in a hurry. I have to wait for a public release of MG, Git is just not something I can work out at this point. You can download development builds from the downloads page. It's aptly under the "Development Builds" header. That's weird... so, is it an installer variant? It's exactly the same as stable downloads. Just built on the build servers from the develop branch. 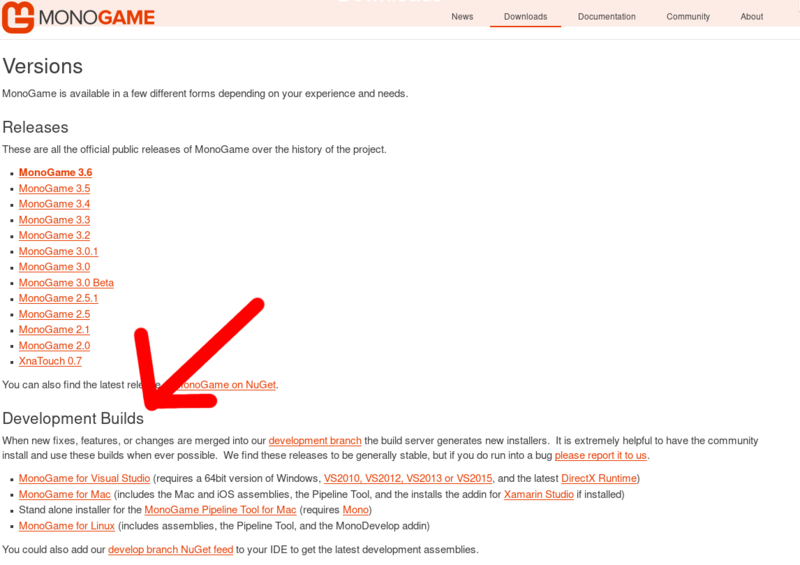 The MonoGame backend also creates installers for every PR request, which makes it really easy to test and ensure new features will work when built with the build pipeline. For Windows 10, you HAVE to use the latest dev installer, as UWP has issues in the 3.6 build. The WACK test still throws the same failed error with the latest monogame but the SharpDX.MediaFoundation pre-release on nuget does fix it. JUST SUBMITTED TO MICROSOFT STORE!!! API MFCreateMuxStreamAttributes in mfplat.dll is not supported for this application type. SharpDX.MediaFoundation.dll calls this API. API MFCreateMuxStreamMediaType in mfplat.dll is not supported for this application type. SharpDX.MediaFoundation.dll calls this API. API MFCreateMuxStreamSample in mfplat.dll is not supported for this application type. SharpDX.MediaFoundation.dll calls this API. API MFCreateSensorGroup in mfplat.dll is not supported for this application type. SharpDX.MediaFoundation.dll calls this API. API MFCreateSensorStream in mfplat.dll is not supported for this application type. SharpDX.MediaFoundation.dll calls this API. How the F&%K do you get around it and if it means cleaning out the DLL and making a null XML then for the love of god put that in a new dev version to force people NOT to use the damn thing until it's fixed correctly!!! Lolol yeah, I know the feeling man. I fixed it by clearing the dll but I believe if you update one of the components on NuGet (see the above comments towards the end of this thread) it should fix the error. If that doesn't work I'd recommend clearing the DLL and just move forward with that. Nope, Tried 5/19/18, didn't do diddly, updates to the latest and greatest monogame, dev. I tested it with my game works like a charm even with multiple tunes, invoking it should be obvious, if not let me know ill post it. Thanks for the code, I imagine clearing that dll will do the trick. I just recently uploaded again to the store with that fix and it worked. Fingers crossed, let us know how it goes! "Oh FYI if you plan on trying to publish via Microsoft Store, don't play any music, if you want to use (see above class) to do it!" Maybe I should add that to the "Things you want to see in MonoGame" thread! This really concerns me. I'm creating UWP game and using XNA MediaPlayer to play background music. Sounds like this will not pass certification? Is using SoundEffectInstance to play background music a possible workaround? Yes, I'm using SoundEffectInstance to play music and passed certification!